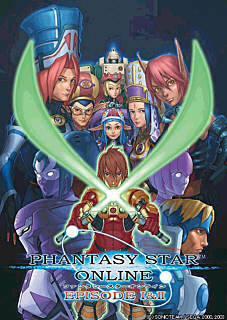 > Phantasy Star Online has taken online gaming to new heights, especially for console gamers. 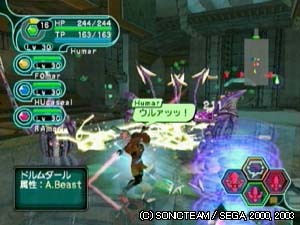 Phantasy Star Online Episode I&II (PSOEI&II) is already available for GameCube, and is expected to hit Xbox largely in tact. I don't have a whole lot of concrete information to share, but here's what I know and have heard. > I know the game will be titled PSOEI&II. This seems obvious, but there has been confusion on this matter. If you don't have broadband then you're out of luck, because that's the only internet connection this game will support. 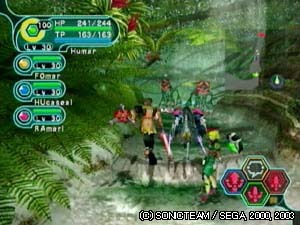 The on-screen button representation will mirror that of the Dreamcast, probably since the Xbox controller has four uniform buttons. With the B button's location being identical for Xbox and Dreamcast, I'm sure the "backwards control" of the GameCube will be rectified. Since the Jungle, Seaside, Mountain and Seabed locations are obviously included, it would seem likely that the VR Temple and VR Spaceship levels are as well. Also note that two of Sonic Team's pictures below have bubble-speech, which leads me to believe a keyboard peripheral will be available. Voice communication is expected to be standard. > I have heard the Xbox version of PSOEI&II will have a new character. However, I have seen no official pictures of him/her, and the first artwork offers no hints. There have been rumors of a keyboard peripheral, and the pictures below seem to justify them. 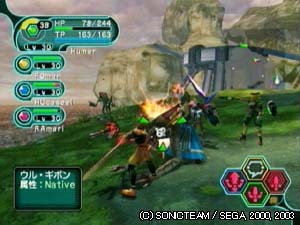 I also heard PSOEI&II for Xbox will be merely identical to PSOv.2 for Dreamcast, but this seems exceedingly unlikely. That about wraps it up for now. > If you want an all broadband PSO with voice interaction, then look no further. 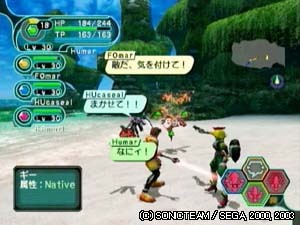 If Sonic Team puts some time into utilizing the power of Xbox and its hard drive PSOEI&II for Xbox could be the version to beat.